I was 27 when I first learned that The Beatles is a pun. Even though I’ve known how to spell “beetle” for some time, I’d somehow never made the connection that the name evokes the Merseybeat scene from which the group initially sprang. Last month, despite having been a journalist for most of my adult life, it dawned on me that “news” is the plural of “new”, meaning that the news is a compilation of different new things that have happened. It’s possible that I am just exceedingly dim, but sometimes a piece of knowledge is so simple and self-evident that you are unable to recognise it. Such information is the nose in your field of vision: always there, unchanging, so the brain ignores it entirely. I bring this up because I’ve only recently realised that it might not be healthy to know what everyone you’ve ever met is currently doing with their lives. The satirical American newspaper The Onion once published an article titled “Report: Everyone Starting New Exciting Stage Of Life Except You” – if, for whatever reason Mark Zuckerberg lost the rights to the name Facebook, this would be an ideal (albeit unwieldy) replacement. In an attempt to kill time while waiting for trains to arrive and kettles to boil, we have found ourselves in a sadomasochistic relationship with a gargantuan corporate entity. This entity uses the lives of people we know to make us feel bad about our own lives, and yet we cannot stop ourselves. Look at the interesting meals your former colleague has eaten. Look at the wedding of a childhood friend. Look at how many exotic countries your co-worker is visiting. Look at the house that the friend of your friend has bought. Look at your dream job being done by your university coursemate. Look at the beautiful child of your ex. It’s their birthday. They’re having cake. Social media can feel like everyone you know is at a party you’re not invited to, one you’re compelled to watch from afar. These people aren’t necessarily more content than you, but when confronted with curated glimpses of pleasure we can only reflect on our own comparative drabness: they are doing an exciting thing while we are looking at a picture, alone on the internet. Study after study indicates that the passive consumption of online broadcasts from acquaintances increases feelings of loneliness and depression: the longer you spend visiting somewhere like Facebook or Instagram, the unhappier you become. We’re hard-wired to absorb information that is immediately available, and so we’re held captive by the stimulus around us. It isn’t just pop-up ads stealing seconds of your finite concentration and time: you hop online to quickly message a friend and before you know it you’re thumbing through the holiday snaps of someone who attended the same primary school as you, dissatisfied and obscurely glum. The belated conclusion I came to, however, didn’t concern social media’s well-documented emotional impediments, as troubling as they can be. An equally pressing problem, I’ve found, is that we’ve inadvertently constructed a system whereby it’s possible to never lose touch with anyone ever again. Where once the default was that most people entered our lives and eventually left them again, now we have to make a deliberate decision to unfriend, unfollow or withdraw completely. Unless rigour is applied, the only people you ever conclusively disengage from are either horrible or insignificant enough to have left no impression at all. Everyone else is still there, simultaneously in our lives and not in them, their presence chiefly taking the form of random periodic reminders that they still exist. You’ve lost touch with them and yet you’re passing a spare minute by looking at photos of them attending the hen party of someone you don’t know. At first glance, this seems like a quietly cheering innovation. So long as you don’t spend too long dwelling online, it can be heartening to see that someone who once meant something to you is doing well. If you’d been born any earlier in history you probably wouldn’t have spoken to that person from your primary school ever again, but now you get to see that they’ve become a seemingly functional adult with a job and a family and very strong opinions about car shopping. Good for them. The mystery of what happened to people from our past isn’t more valuable than the answer, but we learn things about ourselves by moving forward, by shedding parts of our identity and taking on new elements as we go. Surely it isn’t helpful to see continual written and photographic documentation of all of the earlier strands of your life, as if they’re all still happening right now. The human condition is best served by a fading past, a vivid present and an uncertain future. There is value in drifting away from our past, in having people we know naturally fade into memory. 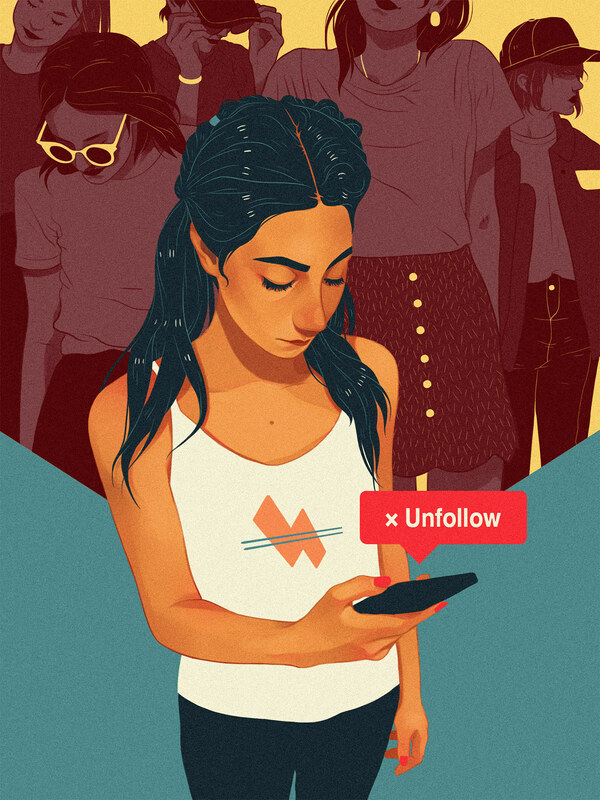 This isn’t about the dispiriting effect of these reminders: maybe the sight of someone you’ve been in a relationship with is acceptable on an emotional level, but how can you truly get over a person when evidence of them is presented to you by an algorithm every other time you’re waiting for public transport? How can the memory of someone from your past guide you when they still technically exist in your present? The secret to moving forward isn’t to act as if the past never happened, but it also isn’t to proceed as if it is moving along with you. For us to also become functional adults with strong opinions on car shopping then we need to keep the past exactly where it can play the most meaningful role: behind us. Originally published in Oh Comely Issue Thirty-Seven. Illustration by Ana Godis.